When planning a birthday party you want to be sure you have some entertainment, especially for children. Children and even adults appreciate some form of entertainment during a party. 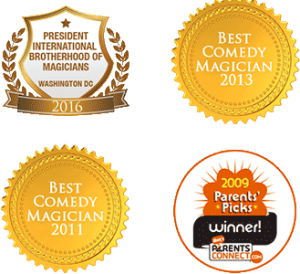 Rather than trying to plan games or even arts and crafts, consider some reasons why you may want to think about arranging a magic show for birthday parties and for any other type of party you’re planning, for kids or for adults. Don’t assume that your guests can entertain themselves when you plan a party. Unless there is a specific activity that they will engage in, chances are your guests will get very bored, especially children. Even adults tend to get bored during a party, which is why some might tend to break away and start to walk around outside the venue or one might bring in a deck of cards! When you plan a magic show for birthday parties you can keep everyone entertained and there is no chance of anyone getting bored or restless. Whether adults or children, they will stay occupied and will appreciate having the entertainment when there is a magician present. There is little to no cleanup with a magic show. Any parent who has thrown a birthday party for children will tell you that usually there is much cleanup to be done if you plan an arts and crafts table or have a bounce house that the children can play in. Arts and crafts can mean glitter and stickers and other residue all over the house once the party is over, and a bounce house means shoes and socks being left out side and sometimes being scattered all over the lawn. However, a magic show for birthday parties can mean something simple and fun without needing to clean the house afterwards or worry about anything being ruined! Some people don’t like games because they’re too interactive and some people don’t like activities that don’t involve them at all! A magic show is a good compromise because some guests can sit and watch and others can get involved as the magician asks for their participation. They’re also not so complicated that children can’t follow the show or so simplistic that older guests find them dull. No matter your guest list, they are sure to offer something for everyone!